As all self-employed in the United States know, April 15 is not only the date our personal income tax returns for the prior fiscal year are due, but also the time when we need to pay our first quarter estimated taxes for the current fiscal year. For me, it is also a time to spend a few hours looking at data I have accumulated during the first quarter and making an attempt to predict future trends. In recent articles, I have noted the importance of data collection (see, e.g., The Business of Editing: Recordkeeping I and The Business of Editing: Recordkeeping II). I have also noted the upswing I have experienced in offers of editing work (see, e.g., The Business of Editing: An Embarrassment of Riches). In those articles, I hinted (at best) at the extent of the data I keep and analyze. This year has been significantly different than previous years. When publishers started offshoring, I could see a trending decline in the number of projects I was being offered. Interestingly, at the height of the offshoring and of the consolidation of the publishing industry, a key indicator was the low number of projects that I declined. (I should note that I do track the reason why I declined a project. This is important data. It makes a big difference in my analyses if the reason was fee, schedule, project size, or subject matter, or a combination of these four. For example, if I declined a project because it was outside the scope of the areas in which I work [e.g., a historical romance novel], then that particular project plays a very minimal role in my analyses; in fact, other than being counted as a declined project, it has no role in my analyses.) At that time, few projects were declined. I could then trace a leveling. Every year following the plateauing of the accepted-declined numbers, I could reliably estimate the amount of work I would have each quarter of the following year, from whom the work would come, and the type of work it would be. That information helped guide my marketing: how much marketing I needed to do, to whom it should be directed, and when it should be done. Beginning in the last half of 2012 I noticed that what had been plateauing was changing. The number of projects and the size of the projects being offered were beginning to increase. Where previously the number of projects being declined had remained low and steady, the trend was starting to show an increase. The data for 2013 reinforced this trend, with the numbers steadily, but slowly growing. Also the data showed an increase in the effective hourly rate, which indicates an improvement in efficiency as well as an improvement in the types of projects accepted. For the first quarter of 2014, the data demonstrates a continuation of the trend. But the data shows a significant spike. For example, in the first quarter of 2014 I was offered and declined as many projects as I had declined for the whole year in 2011 and 2012. The data shows that the number of manuscript pages in the declined projects equals 46% of the number of pages that was accepted. Perhaps more importantly, the data shows that clients increasingly tried to alter schedules in hopes that by doing so I could fit the projects in my schedule. This is an important bit of knowledge because I can look at, for example, 2007 and see that in 2007 clients were willing to alter production schedules for very few projects, but in 2014 it changed to the majority of projects. The data indicates to me that, at least within my niche, boom times may be coming. The first quarter 2014 data is an eye-opener for me. I note that revenues are up 61%, the size of the projects under contract is up 143%, and the number of projects being offered is up 218%, but I declined 58% of gross number (or 46% in terms of manuscript pages), which is also an increase. Unfortunately, because editing is hands-on work that has limits on what can be automated, the number of projects that I can accept is governed by the same key determinants — number of manuscript pages, project difficulty, and schedule — that existed in 2000, which limited the number of projects I could accept in 2000, still control the number of projects I can accept today. But data analysis also discloses how efficiently I can edit. The more efficient I am, the higher the number of pages per hour that can be edited. The higher that number is, the more projects I can accept; conversely, the lower that number, the fewer projects that can be accepted. Although the percentages noted above look great, it needs to be remembered that they represent just the first quarter of 2014. Second quarter data could plummet those numbers when applied year to date. My point is that although analysis of the first quarter is important in the decision-making process for upcoming months, it cannot be the sole determinant. At most it is a guide. Had the numbers been down, however, the importance of the analysis would be much greater; the analysis would be a warning of a negative trend that requires immediate corrective steps. As I said earlier, my first quarter results indicate a change in the publishing industry for my niche and implies that boom times are coming. But even if boom times are coming, who knows how long they will stay. It could be fleeting or it could be years. The answer lies in the data I continue to collect. What does your data tell you about upcoming trends for your business? Are you doing better than previously? Do you limit your analyses to comparing gross revenue? If so, what does that comparison tell you about your business and what you need to do? To Serial or Not to Serial? One thing I have noticed over the years is that what was once controversial in editing comes back to be controversial again. Like the cycle of life, editorial controversies are never put to permanent rest. The current resurrected argument is whether or not to use serial commas. We probably should begin with composition, because that is where this controversy has its origins. The more characters there are in a manuscript, the longer the manuscript. If “unnecessary” characters can be omitted, space will be saved and the cost of production will decline. It might not matter greatly if only one copy is being published, but multiply the savings over thousands of copies and over many manuscripts, and the savings become significant. Welcome to the age of bean counting. What is the primary reason to have a manuscript edited? I see the primary purpose as clear communication. What is the primary purpose of punctuation? To afford the reader clues as to the message the author intends to convey. Consider this phrase: pregnant women and children. A professional editor would not let such a phrase stand. Why? Because it is not clear whether both the women and the children are pregnant or just the women. Of course, many arguments can be made as to how pregnant does not modify children, but there only needs to be one argument that it does to make the phrase questionable. Similarly, as Lynne Truss famously pointed out, a professional editor would not let the phrase “eats shoots and leaves” stand without querying it. Whereas in the “pregnant women and children” instance rewording for clarification is the appropriate path, in the “eats shoots and leaves” conundrum, the correct path is punctuation. Yet how much punctuation? If the intended meaning is that the actor “eats” some food, then “shoots” another actor and “leaves ” the premises, then serial commas are needed: eats, shoots, and leaves. With the serial commas, there is no mistaking the meaning. But those who oppose serialization would prefer a single comma: eats, shoots and leaves. How clear is the single comma version? Not at all. There are two vibrant possibilities: the actor “eats” and what the actor is eating is “shoots and leaves”; the actor “eats,” then “shoots” another actor and “leaves” the premises. How is the reader to know which is meant? Clearly there are a multitude of ways to avoid this situation (e.g., “eats bamboo shoots and leaves”) but the question under consideration is serialization. The premise of the antiserialists is that excessive punctuation interferes with the reading flow, thus minimizing the amount of punctuation enhances the reading experience. Proserialists, on the other hand, see punctuation as necessary to ensure understanding and thus as an enhancer of reading flow because the reader does not have constantly stop and attempt to discern what the author intended. I admit that I fall in the proserialist camp. I see the role of punctuation as the same as highway signage — I need enough of it so that I do not need to stop in the middle of the highway to think about whether to turn right or left. Editing is about comprehension, not about saving space. Editing is intended to laser focus on author meaning, not on fulfilling the latest lexical fashion. Serial commas rarely mislead a reader, unlike absence of a serial comma. So what harm comes about by serializing? A professional editor’s goal is to make the reading experience so smooth that the reader absorbs the author’s message without consciously realizing she is doing so. Sufficient punctuation is one of the tools that brings this about. Insufficient punctuation requires a reader to either stop and attempt to decipher the author’s meaning or to gloss over the author’s point in hopes that either the point was not critical or that it will become clear subsequently. But having a reader battle with insufficient punctuation is not in either the author’s or the reader’s interest. In the case of “eats, shoots and leaves,” the reader either inadvertently draws the correct conclusion or stops to ponder what is meant. What is the negative to the serial usage, assuming the intended meaning is “eats, shoots, and leaves?” There is none and there rarely is a problem using the serial comma (assuming its use conveys the correct meaning). So why have a rule that insists that the serial comma be avoided whenever possible? Why not make the rule always use the serial comma? I am convinced that the rationale for the avoidance rule has nothing to do with communication, understanding, readability, or any of the other metrics that a professional editor should be concerned with when editing. I believe that it is an accountant’s rule: Omitting the “excess” punctuation lowers the financial outlay for a manuscript. The accountant’s rule does not address any of the metrics that might cause a manuscript to succeed or fail in the marketplace; instead, it laser focuses on cost. Yet it strikes me that the cost of misunderstanding, of missing the author’s message is far greater than the financial cost of serializing. If readers have to struggle to understand an author, reviews and recommendations are likely to be negative and thus decrease sales. Ease of reading and understanding cannot be divorced from the decision to serialize or not serialize. The professional editor does not work with absolute rules. For the professional editor, all rules bow to the one rule regarding comprehension, and all rules (except that of comprehension) are flexible. The difference between a professional editor and a nonprofessional editor lies in the rigidity with which the editor applies the “rules” laid out by style manuals and third parties. The more professional the editor, the more the editor determines for herself what the appropriate rules are that govern a particular project, even if it means explaining to a client why a client’s “rule” is being ignored. The one thing that is true about technology is that obsolescence is built-in. Whatever you buy today will, after a manufacturer-predefined time, begin to turn to dust. As I have mentioned in other posts, I have my computers custom built locally. That allows me to choose higher-quality components from manufacturers that I prefer. One part from here, one from there. More importantly, my local computer shop warrants those components for 3 years. For years, I replaced our computers every 18 to 24 months. The technology was changing rapidly and by the time 2 years had passed, it was like moving from the paleolithic era of computing to the future. And the more complex my macros became and the more I wanted them to do, the greater the computing power I needed and wanted. The one thing I didn’t want was to have time to twiddle my thumbs while waiting for my macros to do their tasks. About 6 years ago that changed with the building of our current computers. I had finally hit the top of the hill. Sure changes continued to occur and components continued to improve, but none of them would have had much of an impact on my needs. The machine I had custom built would outlive my editing career — or so I hoped. As with all such wishes, there was something I forgot: components are designed to fail. Manufacturers don’t want things to live forever, so obsolescence is built-in. This past week, my boot drive began to fail. I could tell because it took longer and longer to boot up my computer each morning; because where once the computer easily handled a dozen open applications simultaneously, now it struggled to hand three or four; because I would be working and suddenly everything would freeze for a few seconds. I also began to notice that my data drive also was generating errors. Reads and writes to the data drive (a separate physical drive from my boot drive) took a little bit longer; instructions weren’t being carried out quite as fast (or so it seemed) as in previous times. Although these two hard drives were high-quality drives when purchased, time had passed them by. All traditional-type hard drives have moving parts, parts that eventually wear out. The one thing I didn’t want to happen was for the drive to start writing data to bad sectors, causing corruption, so I took the hints I was being given and called my local computer shop. It took 3 hours of downtime, but in that time, I went from what now seems like crawling to near the speed of light. It previously took a little more than 90 seconds to boot up; now it takes less than 20 seconds. The cure was not only new drives but going to solid-state drives (SSDs). Unfortunately, SSDs are expensive, at least double the price of traditional drives. But with that increased price comes compactness (four SSDs fit within the same space as one traditional drive), no moving parts to wear out (although these drives do eventually lose the ability to write to the disks, they, supposedly, never lose the ability to read from them), no heat generation, and no noise (no moving parts to make noise). Now that I have new primary hard drives, I am thinking about updating my remaining traditional hard drives (six of them: one for storage of completed projects; one to hold my imaging backups; four in my NAS [network-attached storage] box for my daily backups) to SSDs. I am unlikely to do that upgrade soon because of the cost and the lack of real need. None of those drives get the use that my two primary drives receive. The upgrades I will be doing in the coming few months are upgrades to my motherboard, processor, RAM, and video cards. With the new SSDs, my Journals macro that took nearly 26 minutes to run through 15,000 dataset entries on a list of 500+ references now takes closer to 11 minutes (see Business of Editing: The Logistics of Large Projects). It will be even faster once I upgrade the motherboard, processor, and RAM to ones that can take full advantage of the SSDs. With my computer working great with just the SSD upgrade, why would I consider spending even more money to upgrade these other components? Because I will get a high return on my investment — I will make back the cost of the upgrade in just a couple of projects. Remember, I charge by the page so that the faster and more efficiently I can process data, the higher my effective hourly rate will be (see Thinking About Money: What Freelancers Need to Understand). If the answer to the first question is no, then I proceed no further. The only time I will buy is when I must because of, for example, a component failure. I haven’t bought a tablet for work because a tablet can neither improve my speed/efficiency nor positively affect my effective hourly rate. If the answer to the first question is yes, but the answer to the second question is a time frame that I think is too long, such as 20 or more projects or 1 year or longer, then I also do not buy. The return on investment is not sufficient to justify the investment. I need to wait for further technological improvements. In the case of the hard drives, the decision had to be made whether to buy traditional drives or the SSDs. I decided to buy the SSDs because the answer to the first question was yes and to the second it was no more than 2 projects to recoup the price differential; in other words, it made fiscal sense to spend more now to reap long-term benefits. What analysis do you do when deciding whether to buy new equipment or to upgrade your current equipment or even what type of equipment to buy? I’ve decided to start a new occasional series called The Business of Editing. In this series, I will share with you my thoughts about the business aspects of being an editor. My 28 years of experience as editor were preceded by 14 years in the business world in various capacities, which gives me a more diverse perspective than you might otherwise expect. However, my experience as an editor is perhaps more limited than yours in that I only work on long-form nonfiction for publishers; that is, I do not work on, for example, journal articles and similar short-form material, and I do not work directly with authors. My Rule of Three applies generally to two things in my business: whether I should keep or fire a client and whether a client is profitable for me. The two are intertwined. My Rule of Three is one factor in the answer to whether I should keep or fire a client, but it is the determinant in whether a client is profitable for me. If a client is not profitable for me, the client is fired; if the client is profitable for me, I may keep or fire the client based on other factors that I consider. The Rule of Three is this: I never make a decision about a client, especially about the profitability to me of a client, until I have edited three manuscripts from that client. Experience has taught me that one or two manuscripts are not necessarily indicative of the types of manuscripts I can expect to receive from a client. The first manuscript may be so problematic that I am lucky if I earn minimum wage, let alone my desired effective hourly rate. (For a discussion of the effective hourly rate, see Thinking About Money: What Freelancers Need to Understand.) Or it may be so deceptively easy that I surpass my goal easily. Or it may fall somewhere between the two extremes, which is what usually happens. But wherever the first project falls on the continuum, I need to look at additional projects to determine how typical/atypical this first project was. It was at this point that I implemented my trusty Rule of Three, and I have never looked back. I stopped trying to evaluate manuscripts in advance. I discovered that the bits and pieces of what I previewed were not necessarily representative of the manuscript as a whole. Look at it this way: I typically work on multiauthor books, where each chapter is written by a different author or group of authors, that run 3,000-plus manuscript pages. When I was sent sample chapters to evaluate, sometimes I got chapters that were well-written, sometimes I got chapters that were problematic because English was not the author(s) native language, and sometimes I got a little bit of both. But what did three chapters out of 130 chapters really tell me? Nothing very useful. So I took the path of the Rule of Three and now I simply say I’ll do the project. By keeping careful records, especially of the time I spent editing, I found that I could make a reliable general conclusion about a client by evaluating my records after having edited three manuscripts. Three manuscripts seem to give a good balance of what I can expect to receive from a client over the course of time. This is not to say that I do not occasionally “lose my shirt” on a project or run into a manuscript that is so troublesome I would like to make the authors and the in-house production editor run with the bulls, but I can look back over my 28 years and say that the clients with whom I have stayed (and who have stayed with me) are profitable for me and let me exceed my goal effective hourly rate over the course of the year. Like most businesses, editing has a rhythm. Once you find the rhythm with a client, it can be made to work for the editor rather than against the editor. Regular readers of this column know of my praise for macros (see, e.g., The Professional Editor: Working Effectively Online IV — Mastering Macros). Macros let you take advantage of the rhythm. The Rule of Three lets you find a rhythm and macros let you take advantage of having found that rhythm. When you think about the Rule of Three, also think about this: Just as you are evaluating a client, a client evaluates you. Clients continuously evaluate editors. Similarly, I apply the Rule of Three on a continuing basis; after all, clients and manuscripts do change. The key is keeping careful and accurate records and not being misled by one manuscript (or part of a manuscript). You need to look at and for patterns and trends. You need to stay ahead of the curve, and when a good client becomes a bad client, you need to be willing to cut your losses. Similarly, just because a client was unacceptable three years ago doesn’t mean the client isn’t acceptable this year. Try again and apply the Rule of Three again before automatically declining work. Once again I am sidestepping the core issues of this blog and moving outside the realm of publishing. This has occurred because we had to euthanize our Cocker Spaniel two days ago and that has caused me to think, yet again, about some of the moral conundrums we face in our lives. Our children are all adults now, living their own lives with their own cares and worries. Consequently, the animals in our household (until 2 days ago, 2 Cocker Spaniels and 1 mixed breed cat) became our children. (Have you ever noticed how often you talk directly to your pet as if the pet could speak back?) The emotional ties are certainly no weaker than those to our children, especially when there has been a long-term relationship with the pet. 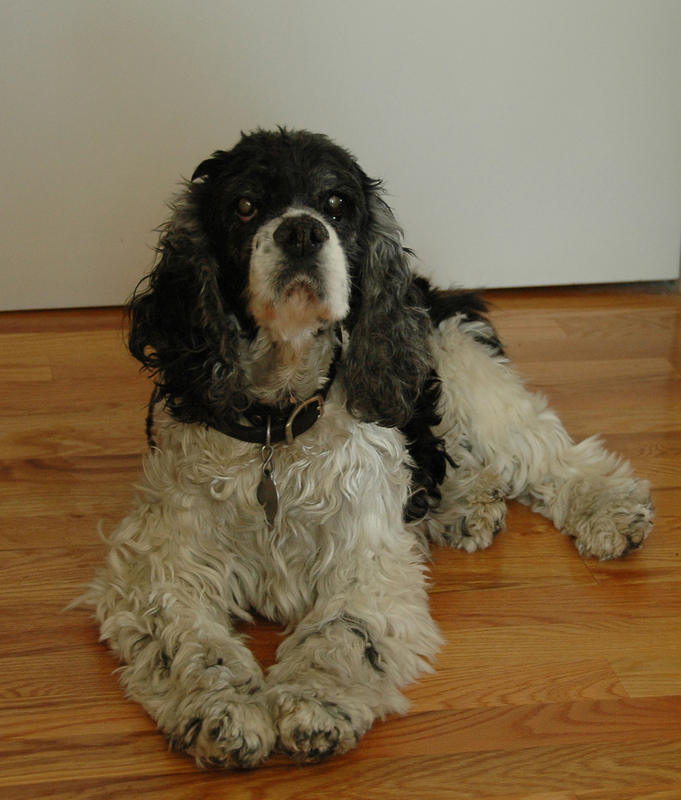 Jasmin, our now deceased 15-year-old Cocker, had been our joy and worry for all but the first few months of her life. She had a rough start, abused by her breeder, but she was a wonderful dog who grew comfortable with her life with us. Then she became ill and the decline that comes with old age began to set in until the past few months when the decline became so rapid that she no longer was the same dog we had known. She was still wonderful, just different as she tried to cope with her ailments. As I related in a previous post, Jasmin’s condition became progressively worse and culminated in a seizure that appeared to us to be very painful for her. Now we had to face a decision that we had waffled around for months: Should we let her continue and die a natural death or should we have her euthanized? This dilemma is not confined to our pets. It is a dilemma that we humans also need to face when we make end-of-life decisions for loved ones. Granted, not authorizing tube feeding is not the same as euthanasia, but the desired end result is the same. We humans have an infinite capacity, it seems, for denying to ourselves the options we would have for our “lessers” in nature’s hierarchy. We have decided that there is a one-size-fits-all morality that we need to impose to assuage our consciences. We see this sense of moral superiority in many different battles. We saw it in the mischaracterization of the universal healthcare plan as including “death panels”; we see it in the debate over abortion; we see it in the debate over physician-assisted suicide. I do not mean to suggest that there is a single clear answer and that one side of the moral debate is clearly right and the other clearly wrong. Rather, I mean to suggest that neither side is right nor wrong, that on a universal level these questions can have no resolution because they all come from a position of belief and the one thing that is absolutely certain is that there are numerous beliefs to which we individually adhere, that we take as a matter of faith, none of which are universally accepted. In Jasmin’s case, I began with the question: “Am I doing this for me or for her?” For me, I did not want to let her go. One more hour, one more day, one more week I wanted. But she was suffering. She was confused (she would walk into a corner and not know how to extricate herself); she wasn’t eating (she had lost one-third of her body weight in a few weeks and had lost 2.5 lbs in the previous 4 days); she wasn’t drinking water (she was dehydrated and had to be given saline intravenously twice a day); she couldn’t stand or walk (we had to hold her up for her to be able to urinate or defecate); she had kidney failure that was progressing at a rate that would have caused her to die in the not too distant future (whether 1 day or 1 week or 1 month, no one knew for certain) — Jasmin was dying and there was no preventing it. So for whom would I keep her alive? Is this not the same question we need to ask ourselves when we make life-giving and life-ending decisions for ourselves and our family members? Yet, we lack the ability to make those decisions for ourselves. Our societal moral structure is set to stop us from considering any alternative other than extending our life — regardless of cost, consequences, or suffering. In the case of abortion, some members of society demand that it be wholly banned regardless of the consequences to either the child or the mother. But what adds to the tragedy of removing decision-making power is that once the child is born, we tend to abandon it, our role seems to simply be to bring the child into being; after that, we often walk away. We deal similarly with end-of-life decision making. Our societal moral structure is set to stop us from considering early termination of life regardless of the means. We do not permit consideration of the costs — financial, emotional, and of the dying person’s suffering — to enter the equation except to say that we (broadly the taxpayers) should not have to bear the costs, only the dying person and that person’s family should bear it. We have chosen to “do it for us”, to do it for our moral conscience even though we are at a distance from the situation; we choose not to “do it for them” because they can’t possibly disagree with our benevolence. There is no easy solution to moral dilemmas — never has been, never will be. There always have been moral absolutists and always will be. There always has been a belief that “I” know better than “you” and there always will be. But what we really need is a way to say “what is good for you is not good for me and we need to accommodate both goods.” The likelihood of that occurring is slim because the arguments are invariably driven by the absolutists, the rigidists, the always right. It strikes me as a shameful commentary on our society that we show more compassion for the suffering of animals than for our fellow humans, that we are willing to allow the question “Am I doing this for me or for her?” to be asked and answered fully only when we are not asking it in regards to our fellow humans, that we do not extend the same ability to decide to ourselves. For Jasmin, may she forever rest in peace.